1. Make a loop over the needle and tie it. This will be your first stitch . 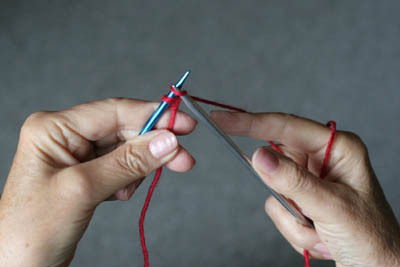 TIP: leave a long strand at the beginning end that you can use later to sew up the two sides of a sweater. 2. Hold the needle in your LEFT hand pointing to the RIGHT. 3. Place your left thumb on top of the needle and your left index finger below the needle. (Your thumb should be closer to you and the index finger away from you.) 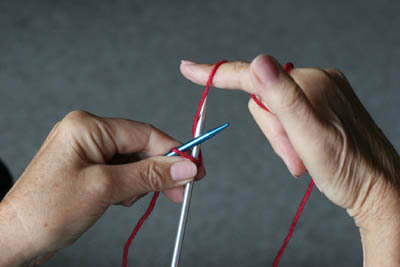 Hold the dangling yarn taut over your right index and below your right ring fingers. 5. 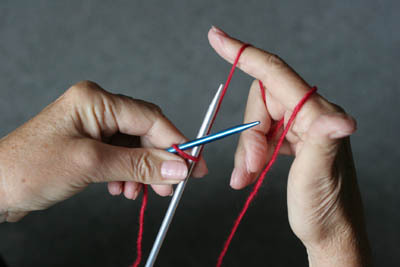 With your right hand put the yarn over the right needle, pull that needle downward while pulling the yarn with it under, pull it forward, twist it up onto left needle. You should now have 2 stitches on left needle. Continue casting on till you have 20 stitches on your needle, or more if you want to keep going for practice.